LOS ANGELES, Sept. 3, 2018 /PRNewswire/ -- How could a medieval Jewish cemetery cause so much debate? "At Vitoria" by Marcia Riman Selz transports the reader from 1950's Bayonne, France back to medieval Spain and weaves a story of success, love, terror, tragedy, shame, and honor. The historical and cultural details make for an evocative narrative that draw the reader in and provide an engaging sense of realism. "At Vitoria" introduces the reader to the CREVAGOS, a Jewish family that copes with adversity and trauma amid joy and daily needs, while living under the shadow of the Spanish Inquisition. Hard work, intelligence and clever spirit create a family of survivors. 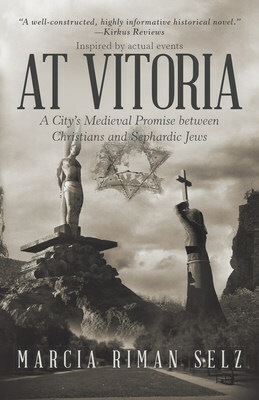 "At Vitoria" is also the story of how, in 1492 when Jews are expelled from Spain, the Christians of Vitoria, grateful to Jewish physicians for saving lives, take an oath to preserve the Jewish cemetery. Almost 500 years later, this promise draws raw emotions from both Christians and Jews. "'At Vitoria' is based on actual historical events and has relevance for today's world," said Selz. "The medieval Christians and Jews of this novel and their descendants show that respect for individual differences, honor, and strength of spirit can generate very desirable results." Kirkus Review calls the book "a well-constructed, highly informative historical novel." "The novel's strength is in its descriptions of the traditions and daily living of a medieval Jewish family," stated a BlueInk Review. "At Vitoria" is a heart wrenching, but ultimately heart-warming read, with a life-affirming message. It is sure to cause smiles, tears, and renewed pride in humanity. "At Vitoria: A City's Medieval Promise between Christians and Sephardic Jews"
Marcia Riman Selz, PhD has had a long career as a marketing consultant to financial institutions. However, after a vacation in Spain, she felt compelled to write about Vitoria and the extraordinary events surrounding the city's medieval Jewish cemetery. Selz is working on her next novel about growing up on the south side of Chicago. To learn more, please visit www.marciarimanselz.com.